iHeartPrettyPolish: China Glaze Doll House - ABC Challenge "D"
China Glaze Doll House - ABC Challenge "D"
Here is the beautiful China Glaze "Doll House" and is my choice for the letter "D" in the Alphabet Challenge I am participating in. I think this would be a close dupe to Essie "A Cut Above" - but it doesn't have any of the tiny pieces of glitter...as you can see in the bottle shots. It has a clear base, but I was happy with the amount of glitter you get when you apply it (this is 2 coats). I wanted more of a full glitter nail, so I went with Butter London Rosie Lee as a base - that is the same shade of pink glitter, but a lot smaller. 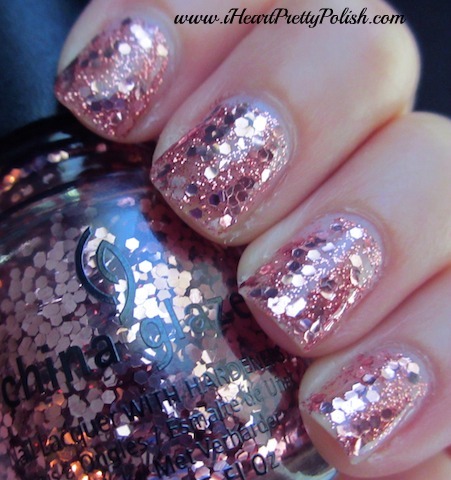 I think this would also look really pretty over Orly Rage, which is a rose gold metallic polish. I'm excited to work with this again and perhaps I can use it for my first jelly sandwich manicure! Wow very blingy! A jelly sandwich sounds like a great idea! I just need to pick up a sheer polish! This is one of those polishes that I've always wanted, always see at online etailers, yet never pull the trigger to purchase! So pretty. That happens to me all the time. Then I see it and wonder why I kept passing it up. Yes, we need to try it for sure:) You have all of those Ballet Collection shades so you are all set! Essie Rae- we really need to compare nail polish stashes - I think we have a lot in common as far as colors go- lol! This is one of my all-time favorite layering polishes. I especially love to layer it over Essie Ballet Slippers. Really pretty combo. So pretty! How have I never seen this polish before? Adding it to my shopping list :) Do you know what collection it was from? Such pretty color and so much fun glitter!! I love it! wow, that's a lot of glitter!! I've never seen this polish before, it looks pretty awesome!! That is some glittery goodness!! I never have heard of this color before. I think you are right that it would look great over Orly Rage! I didn't either until I saw it on Pinterest and did a little research. I guess it was from 2009?? ?